Matthew Steven Sitton was born February 28, 1986 in Clearwater, FL the second of 4 children and the oldest son. Matthew was affectionately known as Matty by his family and friends and was a fun loving, heaven knows what he is going to do next kind of kid. He had an amazing way of connecting with people from every walk of life and was and still is loved by so very many. Matty attended Indian Rocks Christian School in Largo, FL for 13 years when he graduated in 2004. He played football, cross country, soccer, track and his favorite, baseball. He was one of the top center fielders in Pinellas County and competed in state in the 100 yard dash. He attended the University of West Florida, but transferred shortly to Southeastern University in Lakeland, FL where he played baseball. It was very apparent pretty quickly that college was not for Matty so he met with his recruiter, Scott Phenicie and dear friends MSG Ben Pigsley and wife Julie. After scoring high enough on the ASVAB that he could choose any job available, he chose Infantry! He shipped off March 2, 2006 to boot camp Ft. Benning, GA where he broke the record for PT in Company E.
Matty was then assigned to the 82nd Airborne at Ft. Bragg, NC where he trained every chance he could get. He was constantly training to improve himself as a soldier and a leader. His final assignment was Ranger and Sniper, 1st Battalion, 508th Parachute Infantry Regiment, 4th Brigade Combat Team, 82nd Airborne Division, Fort Bragg, NC. 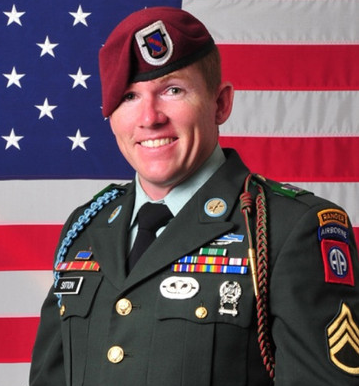 He served 3 deployments to Afghanistan when he was killed by an IED on August 2, 2012. His awards include the Bronze Star Medal, the Purple Heart, the Army Commendation Medal with one oak leaf cluster, the Army Achievement Medal, the Army Good Conduct Medal with one knot, the National Defense Service Medal, the Afghanistan Campaign Medal with a campaign star, the Global War on Terrorism Service Medal, the Army Service Ribbon, the Overseas Ribbon with the numeral two, the NATO medal, the Combat Infantry Badge, the Expert Infantryman Badge and the Parachutist Badge. Matty was one of the battalion's most proficient and well-trained leaders. The bond he developed with his team serves as a testament to how much he was loved and respected by the Troopers who served beside him. His no-nonsense approach towards accomplishing tough tasks was commendable. There was no task that he could not accomplish. Matty is survived by his wife Sarah, son Brodey, parents Steve and Cheryl, sister Jessica McMahan and brother in law Christopher McMahan, nieces Natalye and Isabella, nephew Lathan, brother Jonny and sister in law Brooke and brother Cody and future sister in law Layna. He is dearly missed!